Readers sound off on diversity in the arts, protest regulations, and software disputes. It is not difficult to find artists in Oakland: The city's Cultural Arts department has long boasted that Oakland has the most artists per capita in the United States. But Black artists are not everywhere. As Sarah Burke notes, "of the 45 galleries that take part in Art Murmur, only four are Black-owned, and only three (including Oakstop) are within the vicinity of the First Friday happenings." That means that Black artists have been marginalized from an internationally recognized cultural phenomenon. 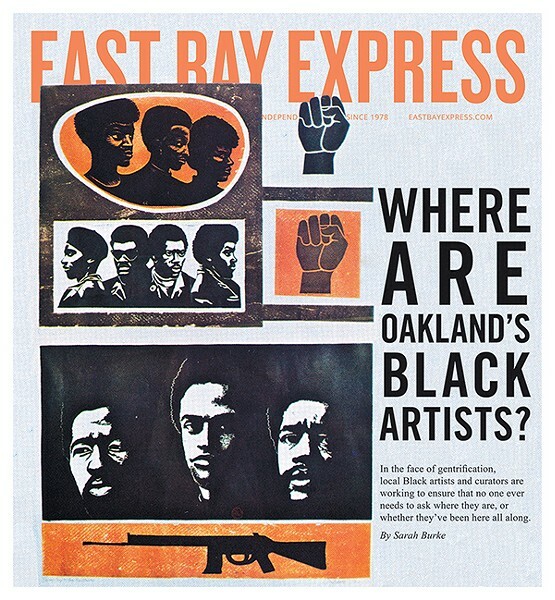 As welcome as an article addressing this issue is, I wish its scope extended a bit further than the "Black Artists on Art" exhibition, impressive as it is, and included quotes from folks from Eastside Arts Alliance and other neighborhoods in Oakland other than Uptown. The story also could have delved a bit deeper into the behind-the-scenes attempts at diversifying the Murmur by interviewing the Warehouse 416 owners, one of the few white-owned Uptown galleries to consistently give space to Black artists. Where are the Black Express staff writers? I think it's obvious to see the motivation behind this pandering. Very interesting read. I'm so glad that the works of these accomplished scholars, artists, and galleries are being discussed and highlighted. There are many, many, many local artists of color who need more recognition for their work. The more exposure, the better. Please do more of these stories, Express. This is such a necessary article. One small thing bugs me, though. Despite Mills being called a "mostly white" institution in the article, it's actually only 44 percent white, and home to many, many incredible students of color. I hope that Conrad Meyers continues to reach out to Mills for the Art Murmur. At Mills, Black artists are plentiful, mad-talented, and just waiting to be discovered. I know this article has so much more to say, but I just wanted to be sure my alma mater isn't being misrepresented in the discussion. Also, glad to see Betti Ono and my pal Carrie Kholi highlighted. Her work is rad! Wonderful feature. The way I understand it, the Paris Expo of 1913 featured art from around the world including Black African nations. Pablo Picasso saw this and began to copy the powerful, primitive Black art. The other Paris artists saw this and also began to use the primitive style. Thus was born the Modern Art movement. So, Black Art has been with us for a long time, and the Black artists should be very proud. Well stated. Vice Mayor Rebecca Kaplan also pointed out recently that OPD has been allowed to blow a hole in the city's budget by spending $13 million more on overtime than was budgeted. Aside from the issues of civil liberties, the city also lacks fiscal management controls and fiscal discipline. When police outnumber protesters, who's patrolling our streets to "protect and serve?" Isn't Rebecca Kaplan on the city council already? Then why hasn't she proposed her plan to it so it can be discussed? I have not heard one peep from any city councilmember on the mayor's new directive. Maybe it's time. Good Ideas, But Can They Be Accomplished? Kaplan makes a lot of sense about using police resources effectively and indemnifying business owners who are harmed by demonstrations. Whether or not Oakland can actually accomplish either of these things effectively or efficiently is another matter. We all have good reasons to be doubtful. Kaplan's suggestions are at least a step toward understanding these problems and looking at likely real answers instead of foolishly leaping in with both feet and suffering the consequences. Why is there more discussion over how to punish window-breakers and stop protests than how to stop police from murdering people, and how to end mass incarceration here in Oakland? Everyone even having this stupid debate is "off the mark." We should be focused on moving toward ending racism instead of how to shut up the people who are pointing it out. What in God's name makes Kaplan believe the OPD can be this strategic when their strategic plan to stop midday car break-ins on Lakeshore Ave consists of putting up a traffic marquee warning shoppers not to have anything showing in their autos to prevent smash-and-grabs? I am in agreement that we should have the right for peaceful demonstrations. I disagree with what Rebecca Kaplan is asking Oakland to do. I feel very strongly that the mayor and city council work together. If they have differences, they should be kept internal. It would be nice to see the leadership working together for the residents of Oakland. The election was over some six months ago and we have Kaplan going on her own! I am personally sick and tired of the attacks on the police. I realize there are good and bad police — same for politicians and every segment of our society. There must be a fair process for all of us when accusations of wrongdoing are made. The real issue as I see it is the 86 senseless murders in Oakland in 2014, and this does not count those who were wounded or shot at! Where's the protest for these victims and their families? Kaplan misses the point. Those legitimate protesters either know or have a good idea who is doing the damage as they are demonstrating together. Kaplan then ends up by asking Oakland specifically what to do! She is one of our leaders. Can she do something?